Quilt Canada 2012 will be in Halifax, Nova Scotia from May 29 - June 3, 2012 at Dalhousie University. This is the third time that Quilt Canada has come to Halifax, in 1984 it was held at Mount Saint Vincent University and in 1994 it was held at Saint Mary's University. At both the '84 and '94 conferences I was involved in the local organizing committee specifically with the workshop planning and teachers. Both times it was a gratifying experience. I met lifelong friends and learned so much. This time I am thrilled to be teaching. I was unable to work on the committee due to family commitments, I missed being a part of all the planning but it is kind of exciting to not know and to be able to look forward to all aspects of the conference. It has been a while since I was last at a QC. I have taught at 3 previous ones, Ottawa, Saskatoon and Montreal. This time I am teaching 3 workshops, all by hand! I'll be teaching Stab Stitch Quilting. I was taught to quilt this way almost 39 years ago by Polly Greene. Penny Candy (inspired by the traditional pattern Chinese Coins), machine pieced and hand quilted. I will also be teaching hand applique. Running Around in Circles inspired by Kandinsky's Colour Studies: Squares and Concentric Circles, machine pieced, hand applique and hand quilted. The great thing about applique this way is that there are no templates, it is needle turned, hand stitched with a blind stitch. The third workshop is based on a quilt in the Nova Scotia Museum collection. The Waternish Star quilt is hand pieced and mine is hand quilted. It has approximately 4,000 pieces. The original quilt was found inside another quilt. When the original quilt wore out around the edges and became well worn the frugal maker used it as a filling for another quilt. Fortunately the interior quilt was discovered, the second outer quilt was carefully "unstitched" and removed. 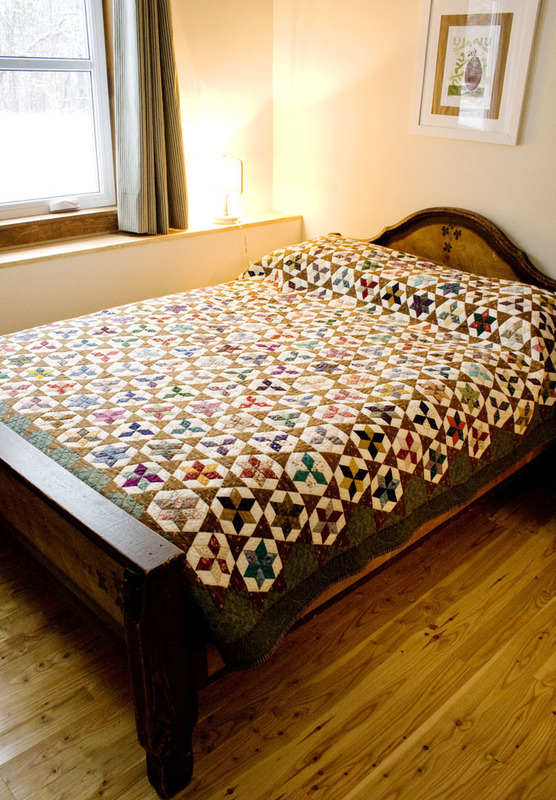 To date we have not found an original name for this quilt so it remains the Waternish Star, named for the small community of Waternish, Guysborough County, Nova Scotia where it was found. Several years ago I purchased a copy of Quilts in a Material World by Linda Eaton which is about the quilts in the Winterthur Museum collection. Much to my surprise there are 2 examples of this quilt in this book. That is the first time I have come across the Waternish Star anywhere else! I have been in touch with Linda about the pattern but to date we still don't know anything more about it. I loved piecing this quilt. It went everywhere with me and I stitched the diamonds into hexagons then sewed the strips together adding the connecting triangles. I worked on this quilt over many years. I jokingly would refer to it as "my life project"! I never knew when it would be finished! Can't wait for May 29! Hope to see you at Quilt Canada 2012.